Once again, we are under our $1,000 monthly budget. Not by much though, and we'll have to be really careful in January when our daughter and grandson come to visit, plus we will have higher gasoline expenses because of our upcoming drive south of Acapulco. Yesterday started off beautiful, but we actually had some clouds move in later in the morning and even had thunder in the afternoon. Saw one or two rain drops, but certainly not enough to say it actually "rained" so we are maintaining our rainless streak that now stands at 11 weeks. Just another beautiful morning at Hacienda Contreras yesterday, but after lunch we were off to a wedding! Fellow campers Ulli and Heinz were going to the Las Jaras hot springs in the town of La Garita and they invited us to come along. So we left just before 11:00am. It was about a 40 minute drive on the other side of Mazamitla. All of the campers hiked over to the "castle" yesterday morning. It's not really a castle, but it is an interesting building that you can see from the campground. Ruth and I were there just last February, but some of the campers had never been before. You would almost think that sunset photo has been touched up, but that was the true color of the sky. We have beautiful sunRISEs almost every day here at Hacienda Contreras, but it's not very often that we have a sunSET this colorful. There is always something going on around here. Never a dull moment. We were just starting our morning walk around the park when we were hijacked by Barb and Sal who were going into town to see Barb's Christmas present. She had no idea what it was...and it turned out to be a burro! Well that's a very cute grandson, even if we do say so ourselves! Can't wait to see him and Lindsey next month. Cameron is now almost 9 months old. Seems not that long ago that we were up in Nova Scotia for his birth. Time sure does fly when you're having fun! RV'ing in Mexico for under $30 a day. I just wanted to give an overview of how much it cost for our 6 week trip (actually 46 days) around Puerto Vallarta. RV'ing in Mexico can be so inexpensive! At 6,400 feet altitude, it does get chilly at night. The temperature inside Sherman when we wake up in the morning is around 10C (50F) so we put the furnace on for half an hour to take the chill off. But by 9:00am it's warming up outside and with the sun shining it becomes perfect daytime weather around 23C (74F). Didn't rush out of Colima yesterday. Figuring we would let the morning traffic die down, we left at around 9:00am, and got onto the toll road heading north towards Guadalajara. We've done this route a couple of times before, so we were familiar with the roads. Arrived in the city of Colima around 11:00am. This is the third time we’ve driven that highway, so we’re now a little bit familiar with the area. There’s no actual campgrounds in the city, but there is a listing in our Mexico camping guide for an event and party salon that allows RV parking. So that’s where we went. Went for a walk along the beach yesterday morning before leaving Manzanillo. Beautiful sunrise with the ships in the harbor, and as we were walking a cruise ship was coming into port as well. But we wanted to get out of this part of town before things got busy, so we left right after our walk, just before 8:00am. Yesterday morning, we went for a bike ride to Melaque. It was only about 4.5 kms each way. Besides seeing the town, we had been invited to visit one of our readers who has a house there. But it wasn't meant to be! Only a short drive yesterday morning. We drove a total of 20 kms (12.4 miles) to the towns of Melaque and Barra de Navidad which are on opposite ends of the bay. Went for a walk in the village yesterday morning. We were looking for a view, and there is a new house built way up on the side of a hill so we found the road that leads up there. Very steep! We had read about a new campground a couple of kms inland from La Manzanilla. So we set off yesterday morning to check this place out. It was only a 63 km (39 mile) drive. Went for a bike ride to explore the town yesterday morning. Quite a few Canadians have bought property in the area and built winter homes. Most of them previously showed up here in an RV, then decided this was where they wanted permanent winter digs. We are parked up at the Hotel Punta Perula (GPS 19.59053 -105.12751). They have seven RV sites at this nice place, and there's only us and one other couple. We were up at 6:00am yesterday morning, and had the tanks dumped and the water filled by 7:00am. Gary was up to say goodbye to us, and we hit the road about 7:10am. What a fun day we had yesterday! Well, not so much in the morning as Ruth did a bunch of laundry...but just after lunch Gary took us on the ATV's up to the tequila ranch in the hills. And THAT was fun! We were up at 6:00am yesterday morning, and by 7:00am we headed out on the 2.3 km (1.4 mile) walk into town to catch the bus. We had to catch our second bus at 9:00am, and we arrived there just in time! Well, I said we would be busy here, and we have been. Took us a little while to get going yesterday morning, but then we packed a few snacks and headed out on the 4 wheel drive ATV's up into the hills with Gary. Yes, this is the drink sourced from the fruit of the nopal cactus. The healing properties of the nopal cactus have been relied on for centuries by native peoples and they're now available in Nopalea. Our plan for yesterday was a hike in the morning, and a bike ride in the afternoon. The first part of the plan came together, but we lost ambition for the bike ride, so we'll get to that this morning! We figured out how to take the local bus from here to downtown Puerto Vallarta. We walked about 2 kms into the town of Valle de Banderas and asked at the central square where the parada (bus stop) was. Around 11:00am yesterday, Jean came by and asked if we wanted to go into town. That was our plan anyhow, so we went with her...sort of! She took her quad ATV, and we followed along behind on our bicycles! We woke up at 6:00am yesterday and got ready to leave Sayulita. We had a coffee and wrote the blog post for yesterday, and we were on the road by 7:00am. Kind of surprised that there was still a fair bit of traffic at that hour on a Sunday morning, but I’m sure it was quieter then than it would have been later on. We slept fine parked on the road. We were still up early though, we tend to get up around 6:00am anyhow when the sun starts to come up. We woke up yesterday morning to the sound of singing. It was about 6am, and the roosters were crowing, and a guy was singing. Loudly. He was quite good though. He was singing while he was washing his car. It was time to get up anyhow, so we did. Opened the blinds, and watched this guy go get his horse. He walked the horse up beside his car, and proceeded to wash his horse. All this while singing at 6am. We love Mexico. Before we left Rincon de Guayabitos we had one last walk we wanted to do up the hill behind the town of Los Ayala. So that's where today's header pic was taken. Nice view, and good exercise. Then, it was time to move on. Well we sure didn't plan on staying in Rincon de Guayabitos this long. Gonna have to get a move on because we've only got three weeks left to get back up to Hacienda Contreras for Christmas! Went off to do some exploring yesterday morning. The two towns here, La Penita and Rincon de Guayabitos, are separated by a river. Guayabitos is more of a resort town with a nicer beach, and La Penita comes across as more of a working class town, although it also has it's share of rental accomodations. Not quite as touristy though. Whales? There are no whales in this area. At least there weren't yesterday. The whales took Sunday off! So it's a good thing we didn't pay very much for our three hour tour, because it was a kind of a bust. Well today is a special day! If you look on the left sidebar it says "We are almost 50 years old"....now I'm going to have to change that because one of us is 50 years old! We left Chacala yesterday morning and drove the 30 kms (19 miles) to Rincon de Guayabitos. This town caters more to Mexican tourists from Tepic and Guadalajara. There are a few American and Canadian people here, but that is largely due to the 7 different RV parks in the area. Yesterday morning we went for a walk to try and get to the beach on the other side of town. It turns out that the entire property surrounding the other beach is private property and inaccessible by the average person. The only way to get to the beach there is by boat. All beaches in Mexico are public property, however sometimes access to a beach can only be by boat. We were up early yesterday and we left Tepic at around 7:15am. Made a quick pit stop for 52 litres (13.8 gal) 500 pesos ($39.00) worth of gas and we were on our way. We like to get an early start, and arrive early. Besides, we didn't know exactly where we were going to end up last night. Yesterday we caught the 11:00am bus back to Tepic. This time, we did manage to get the cheaper bus at 220 pesos ($17.16) each. And, it was a nicer bus! Watched a Steve Martin movie en Espanol, and the trip was uneventful. Yesterday morning, we went back to the historic central area with Lee. She works as a volunteer to help tourists in need of information or directions, so it made sense to share a taxi down there because we were meeting fellow bloggers Contessa and Colin in the same area at 11:30am. We've been in Mexico for 8 weeks now, and we finally made it to the ocean! But first, we had to have some breakfast, and Lee took us to a restaurant called "Te amo Lucy"...I love Lucy. The restaurant is owned by an ex-pat American, and his Mexican wife Lucy is the chef. We left Sherman at 6:00am yesterday morning an walked to the bus terminal. We had done this route the day before so that we would be familiar with where the station is, and so that we could confirm what bus we were taking etcetera. The plan was coming together. Or so we thought. Well, by the time this is posted, we will be on a bus to Mazatlan! First thing yesterday we had to find a laundry. The lady here said there's one two blocks away, so we walked over there first and made sure they were open and could do it before we lugged our clothes all that way. We got ourselves set up in the Los Pinos campground in the city of Tepic. The campground itself has been here for many years, and the city has grown around it. Now, you have to enter below an arch that is part of a little shopping plaza and if you didn't know it was here, you might have a hard time finding it. We said our goodbye’s to Bonnie and we left Delia’s Trailer Park near Etzatlan at 10:10am, just a little later than we planned. Yesterday was our last day here at Delia's Trailer Park. We're heading out of here this morning, back on the road! We decided to walk into town yesterday morning. It's not really that far and Bonnie had said that the town market was on Saturdays. What a busy day we had yesterday! We had the use of Bonnie's car for the day, and we were going to the ruins at Tuechitlan. But near there was the road turning off to Piedras Bolas, so Ruth came up with the idea that we should return there to complete the hike we tried to do last Monday. Had a relaxing morning yesterday. Then Bonnie had said we could use her car to go visit some ruins, but she needed it again late afternoon so we said we would wait another day because we didn't want to rush or risk being late. Another beautiful day. Bonnie was driving into town early so we hitched a ride with her at about 8:30am. We wanted to hike up to the mirador (lookout) up the mountain behind the town. When we arrived here at Delia's Trailer Park on Monday, a woman came out and welcomed us in Spanish. We said our hello's, and I was quick to explain that I only spoke a little bit of Spanish. She asked if I spoke English, and I said yes. And it turned out that her English is perfect! We made it to a little RV park just outside the farming community of Etzatlan. But what a ride we had getting here! There was no easy direct route, so instead of taking the main highway back up to near Guadalajara, I decided to take some backroads. We wanted to leave Roca Azul early yesterday, and it was 8:07am when we did. We knew we only had a short drive, but because it was Sunday we wanted to get to our destination ahead of the crowds. Another beautiful day yesterday, and we decided to go exploring on our bicycles for the first time since entering Mexico. We ended up doing 23 kms (14.5 miles)! We left Hacienda Contreras at our planned time of 10:00am. Said our goodbyes to Barb and Sal and their daughter Andrea who's visiting for a few days, and we look forward to returning in time for Christmas. Just a short note this morning. We're hitting the road again today! After nearly five weeks here at Hacienda Contreras, it's time to go exploring! Pronounced "tow-pay". Or several, as in topes "tow-pays". This is the Mexican version of a speed bump, and they are everywhere in Mexico. And, they are very effective. Day of the Dead. November 1st and 2nd are Day of the Dead celebrations in Mexico. It's actually one of the reasons we're still here at Hacienda Contreras as originally we were expecting to have headed out by now. October, our cheapest month ever! Well, in keeping with our budget goal of $1,000 a month, we are pleased to report record low spending for the month of October! Living expenses came in at a total of $707.14. Hunting for wild potatoes is like fishing! And I'm not into fishing. However, we still had a fun day out in the mountains. We picked up Martin and his father Don Jose, and drove out of town at just after 6:00am yesterday morning. Don Jose grew up in these mountains and knows the area well. Well, not quite but we will be leaving here at 6:00am...therefore posting this before going to bed! I was reading about RV'ing in Guatemala and Belize, and I thought we might take a trip through there in the spring. Then I thought, if we're going to do that, why not go all the way to Panama? If you think baseball is boring, then last night's game would have changed your mind. No point in going into detail, because if you're a baseball fan then you already know, and if you're not, then you don't care anyhow! That's it, we've had enough of this damn blue sky and sunshine. And I'm tired of having to wear shorts and t-shirts every day! The view from under our awning. Another beautiful blue sky day. Last year, we managed to go three and a half months without a drop of rain. Wonder what the record will be this year! Yesterday, Barb was going back to Chicago to visit their daughters for a week and a half. Sal was driving her to the Guadalajara airport, and they asked if we wanted to go along for the ride. They were also going to stop at the Sam's Club and the Walmart, so we could pick up any items we might need. Ruth and I went on a nice hike up another hill in the area. We could see a road in the distance on the hill, and wanted to see where it went. It was a private road with gates and fences, but the rancher working at the bottom said we could go for a walk, no problem. Barb was going into town, and Saturday is market day in Valle de Juarez, so we went in with her. First, we stopped at her house and used Skype to say hi to our son, then we went to the main square and picked up some meat at the carneceria (butcher). Wow, I can't believe we've been here for three weeks already. And although we're not bored yet, we are getting excited about moving on especially after planning our route yesterday! Well it looks like everybody who wanted to vote took the time to do so, and we want to thank everybody who participated in choosing where we're going next. It looks like we're taking the route around Puerto Vallarta, so I've been doing some planning for that trip! A busy day with lots of photos! More perfect weather, so we decided to hike up the hill in front of Hacienda Contreras. But first, Barb was going into town to see the metalworking guy who was building the frames for the windows for the new addition. Well, we just had a lazy day yesterday. Other than our two mile fast walk around the park in the morning, it was just a relaxing day. And once again, the weather was perfect. Yesterday after lunch, Ruth and I went into the town of Mazamitla. On the far side of town is an area called Los Cazos. It's a kind of a different spot because while there are homes and cottages in there, it's also gated and you have to pay to get in. But it's really nice to walk around, and there's a pretty waterfall. Yesterday, we went for a nice hike in the hills. It was another beautiful sunny day. Barb stayed behind in case the tile workers showed up. She wants to make sure they use the proper tiles in the right place because once they go down it's too late! Clear sunny skies and a high around 26C (79F). Perfect! The clear skies do bring some cooler nights, but it's nice sleeping weather. Woke up this morning and it was 5C (41F) outside, however the sun is shining and it's starting to warm up already. Looks to be another beautiful day here in the mountains south of Guadalajara! Well I lied. Yesterday I said "today we'll visit Mazamitla for sure" or something like that, and then plans changed! Barb and Sal were going into the city of Sahuayo to order some floor tiles for the new construction, and asked if we'd like to tag along. Well the rain dogged us again on and off all day yesterday so we just hung out here. We did get patches of blue sky in the afternoon and we took advantage of that to go for a walk, but by evening it was raining again. We have to think that all this rain is payback for the three and a half months of perfect weather we had last winter! Well, it may be wet, but at least we're not cold and that's the most important part. Well I hate to keep going on about the weather, but it's kind of affecting our day to day activities! Normally the rainy season is over by now, but this latest hurricane has put a "damper" on things! Hurricane Jova is expected to hit landfall this afternoon as a category 3 hurricane. It looks like Puerto Vallarta is going to take a direct hit, but then the storm looks to be heading north from there. Because we are at 6,300 feet elevation, much of the wind should dissipate, plus we are on the eastern edge of the storm. Well, we are getting what was forecast, on and off rainshowers and lots of cloud. The hurricane and tropical storm are still in the ocean and moving very slowly. Now not expected to hit landfall until Tuesday evening. We've been having some very cloudy days as this storm system makes it's way to us, so we've plugged into the electricity here. Solar panels work great, but only when there's sun! There are two large storm systems heading our way that are expected to dump a lot of rain over the next few days. Where will we go next? We are going to let YOU decide! We are quite happy relaxing for the month of October (and possibly a few days more!) and exploring the area around Hacienda Contreras. However we’ve been thinking about where we want to go when we’re ready to move on and we’re going to let you make the choice for us! Other than one four month stint housesitting, yesterday marked four full years living in a motorhome. It was October 5, 2007 that our house sale closed and we moved into Sherman. Yesterday was a good day. Absolutely perfect weather, sunny with a few clouds and a high around 27C (81F). We did a 2 mile jog/walk in the morning and then I started washing Sherman. Got out the ladder and did the top half of one side. I'll do the lower half this morning. We had a relaxing day yesterday. Spent some time on the internet while having coffee and tea when we got up, then we went for a walk around the RV park. The perimeter of the park is a half-mile walk and we did four times around so we did two miles. Woke up yesterday to clear blue skies and sunshine. The high was 26C (79F), and although we did get some clouds in the afternoon the weather was otherwise perfect. One of the things we love about this area is the temperature. Nice cool nights that are good for sleeping, and just perfect during the day. Well that was a costly way to end our fourth full year living in a motorhome! September was an expensive month, partly due to gasoline, but we also stocked up in the food department for an extended stay in Mexico, and we did some costly maintenance to Sherman. We spent $4,677 for the month, our most expensive single month in the last four years. We didn't set the alarm Friday night because we knew we needed a good nights sleep. But we also wanted to do a long drive Saturday and so we wanted to get a fairly early start. Turned out we got a good sleep and we were on the road just before 9:00am. Not bad. Thanks you all so much for the outpouring of support. We are a little overwhelmed by your comments and thoughts, many from friends we have not yet met. We're so glad that some of you were able to share Whiskey's company over her last few weeks with us. Whiskey passed away just after 1:00am this morning. We had a great 15 1/2 years with her. It was pretty much a relaxing day today, although we did get some work done. It doesn’t start to get really hot until after lunch. After I posted yesterday’s blog, we headed off to find the trailhead for the hike up the mountain. We walked along the arroyo (dried up river bed) about a half an hour until we came to a cairn that marked the entrance to the trail. It was a HOT day yesterday. 39C (102F) in the shade. There is a swimming pool here, but they're in the process of putting fresh water in it and it takes 24 hours to fill up, but we will have the use of the pool today. Supposed to be slightly cooler today though anyhow. Didn’t get any sleep Saturday night. None. As expected, the church party went on as a lot of Mexican parties do, right until sunrise. The music was loud and it never stopped. We were up at 6:30am yesterday to get an early start for the border. The Columbia Bridge border crossing is actually about 25 miles (40 kms) west of the city of Laredo. We like this crossing because it’s never busy and there is lots of easy parking for an RV of any size. We had our best sleep in days at the fairgrounds near George West, Texas. They have only just installed rows of full hook-up RV sites there, but we didn't use them. We just parked. Yesterday's blog got posted late, so you may want to check it out first before reading the story below. We got an early start yesterday. We're trying to get back into the habit of leaving early and arriving early! We took all Texas backroads and arrived at our destination around 2:00pm. We left Hot Springs National Park at a decent hour, but as soon as we left we came across a laundromat. We were going to have to stop and do laundry at some point today, so rather than risk trying to find another one, we simply stopped right away. We took a break from driving yesterday and hiked into the town of Hot Springs. There is a one mile hiking trail that goes from the campground into the town. It poured with rain all morning, but things cleared up a bit by 11:00am or so. We did a fair bit of driving yesterday, and it was all on the backroads. Plus, we didn't start off until later in the morning so we didn't arrive at our destination until after 4:00pm. We got an early start out of the Round Spring Campground yesterday morning. We took advantage of the facilities and had a nice quick hot shower. Then on our way out we used the dump station for the first time this trip, and topped up our fresh water tank. We actually had a good night sleep at the Salem, MO Walmart. Interesting note, there has been a Walmart in the town of Salem, MO since 1971… store #46, if I remember correctly. Saw a sign that said they have one employee who has been there for 40 years! I hope she was able to take part in a share purchase plan! Well the highlight of yesterday was the weather. A storm system moved in yesterday morning that dumped a pile of rain on us all day, with a high temperature of only 61F (16C). Yesterday morning, Sam and Donna took us down to the old section of the city of St. Charles. This is famous as being the spot where Lewis and Clark and their dog Seaman set off for their expedition way back in 1804. Today was our big trip to downtown St. Louis. We've never been to St. Louis before and we were looking forward to seeing a new city, and we were looking forward to meeting some new RV'ing and blogging friends. We had a fun, relaxing day yesterday. Even managed to squeeze in an afternoon nap! Another long driving day, but now we can relax! We actually slept in yesterday morning, and didn't leave the winery until almost 8:00am. Whiskey seems to be back into her normal schedule now that we've left Ruth's Dad's where she had been waking up around 6:00am every morning. Just another driving day. Did 299 miles (478 kms) today. Considering that we normally like doing about 120 miles (200 kms) a day, this is a lot of driving for us. But Sherman is doing fine just truckin' along! On the road early again yesterday morning, and managed to do another 235 miles (376 kms). Mostly on backroads again, but did do a little bit on the Interstate. We were up early yesterday morning to the sound of raindrops on Sherman’s roof. We said goodbye to John and Ellen and thanked them for their hospitality. We enjoyed our time visiting Ruth's Dad and want to say a big "thank you" for putting up with us and letting us use the shop and tools to fix up Sherman! We left at around 7:50am, which was later than our planned 7:30am start. We were supposed to be at the Canadian Tire in Kemptville for 9:00am for Sherman's emissions test, and we made it at 9:05. They took us in right away, and as expected, Sherman passed with flying colors and the bill was $35 plus tax. Got Sherman all ready to go yesterday, and we're hitting the road! We head out tomorrow! And other than Sherman needing a bit of a tidy up, we're pretty much ready to go. The only thing I didn't get done was to finish cleaning the roof and touching up the roof caulking. That will have to be done on the road sometime because it's supposed to rain on and off here today. Wow, thanks for all of the interesting and well thought out comments regarding my restaurant situation the other night. I agree with those of you who think the waitress messed up and forgot to put the order in. If that was indeed the case, I wish she would have just come right out and said that to us! We probably would have been more accommodating and felt bad for the girl. Anyhow, I guess we'll never know. How long should you wait...? I was out for dinner last night with four old friends. Went to the Heart and Crowne pub in the market area of Ottawa. Again, spending more than we wanted to, with August coming in at $1,747. But, the majority of the extra was split between vet bills for Whiskey and renovations for Sherman. That's the name of the Ontario vehicle emissions testing program. It's just a big money grab because the vast majority of vehicles tested pass with flying colors. For cars, the test costs $35. But for motorhomes, there is confusion. I had to post a couple of pics just so you know I have been working! It's a bigger job than I thought it was going to be. Cutting out the old carpet on the entrance stairs was difficult and they had so many staples holding it in there that it was apparently not meant to be removed! We leave a week from today, and it's going to be a busy week! Didn't get much done during the day yesterday because we went into Ottawa for lunch with my Mom and two sisters. So after supper I worked on the floor until about 10pm last night. We got into this motorhoming thing about four years ago. In fact, we had never even been in a motorhome until July of 2007. We always thought of motorhomes as being crammed into RV parks with your neighbor being parked about 10 feet away and we knew that wasn't for us. But then we met Glen and Steve. I got some more of the old carpet cut out from around the entrance steps. We're going to replace it with the same fake hardwood laminate that we're putting through the kitchen and bathroom. Of course they had it held in there with a gazillion staples, but I guess that'a the way they do it. At least it never came apart in 16 years! Well it's only 10 days until we leave so we were looking at our route south. We have a few things we want to see along the way, and I've included some of them on the map below, but we've been known to stray as we find things to do that are close to our plan. Well the carpet is done and we're very pleased with it. It was a bit more difficult than I expected though, and my hand is sore this morning from cutting the old carpet out yesterday! I took a small patch of the old carpet with me into the city yesterday, and the first place I stopped at was able to match it up pretty good with a short roll they had in stock. We leave here September 6, so there's only two weeks to go! We're making good progress though and I'm confident we'll have everything ready by then, including replacing the carpet. That's the only real big job left on the list. It kind of rained on and off all day yesterday, so didn't get much done. I did adjust Sherman's drivers door window, but I don't think it's getting any better than that. I have a feeling it's not the original one and that it was changed at some point, so this is as good as it gets, but at least it's slightly better than it was. Okay, so we're going to Mexico and odds are good that it will be for an extended period of time. Sherman is registered in Ontario, and so has Ontario license plates and a renewal sticker that expires in February 2012. Picked up Sherman's new heater control valve and got it installed yesterday. Fired him up, tested everything for leaks and everything works great! Making some more progress on my list of things to do to Sherman. Got the new cupboard doors made and installed, and I'm very impressed, even if I do say so myself! I had a busy day yesterday. After we finished with Whiskey's vet visit, I headed down to Ottawa with a list of things to do. Well, we spent an hour at the vets. They gave her fluids because she was dehydrated and some medication to settle her stomach. We also have taken home fluid replacement and have to administer them ourselves for the next three days. We're off to the vet again this morning. Whiskey has been getting progressively worse the last two days and now can't keep any food down. I was up four times with her last night, coming out both ends. Worse, is that now she's not even interested in eating. Some of you think I've got lots to do over the next three weeks! Well it's true, but I'll do a little bit every day and before you know it, I'll be done! Didn't get anything done to Sherman yesterday, and when I look at what I still have to get accomplished we can't have many more days like that! We're only here for another three weeks and I don't want to be rushing around near the end trying to get things done. Might have got two or three hours sleep last night. Poor Whiskey had a bad night with an upset tummy, so Mom and Dad had a bad night too. We think it's a reaction to the rabies vaccine and so all we can do is see it through. So we visited Red Pine Camp yesterday. It was about an hour and 15 minutes drive to beautiful Golden Lake from Ruth's Dad's place. We got up there about 11am, and went searching for my sister Alison and her son Marshal. So we took Whiskey to the vet yesterday afternoon. She needed her rabies shot updated for her to be able to enter the U.S. next month. Whiskey actually let us sleep in this morning. She's been waking us up at just after 6am for the past while because she wants to come down to Ruth's Dad's house. We are sleeping in the motorhome, up at the top of the backyard. You might remember that we won a GPS edition of Microsoft Streets and Trips from Sam and Donna's contest back in February. We installed it on the laptops in early April, but for whatever reason we never really sat down to figure it all out until now. If the U.S. government were a family, they would be earning a fairly decent $58,000 per year. But they would be spending $75,000 per year. On top of that, they would owe $327,000 in credit card debt. Currently planned deficit reduction measures would reduce their annual spending to $72,000 per year. More puttering around on Sherman yesterday. Ruth got the panels recovered between the cupboards. They had a green coloured fabric on them and Ruth made them the same as the curtain valances she had recovered last year. Spent some time yesterday morning working on a water leak in my father in law's car. Think we got things fixed, but that pad under the carpet sure does hold a lot of water! Got to let things dry out before putting it all back together. Most RV's and motorhomes weren't designed to be lived in, so when they are subjected to that lifestyle they get a lot more wear and tear than they were designed for. Plus, Sherman is a 15 year old motorhome so we need to keep on top of things in the repair and maintenance department so that he will be with us for as long as we need him. It's difficult to plan too far in advance. Certainly there are things that you want to do in the future and you can have goals you want to accomplish, but a lot can happen to change your plans. Went into the town of Arnprior today and to their DMV office. One person in line in front of us, and we were in and out of there in less than 10 minutes. Paid $10 to replace my lost drivers license. We left here around 10:00am yesterday and headed for downtown Ottawa. We had a whole list of things to get accomplished, and it turned out to be a pretty productive day. Well July was another expensive month. We did a lot of driving, and with two vehicles, so we bought a lot of gasoline. And, I had my border visa thing for $585, so that upped our miscellaneous expenses. 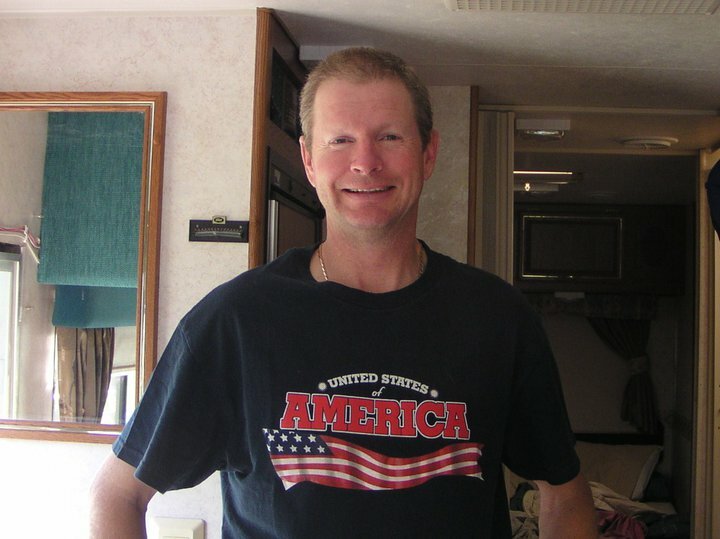 I mentioned yesterday that I have quite a few things to accomplish with motorhome repair and maintenance. But there are also some upgrades and changes we want to make. Fortunately, Ruth's Dad has a full workshop and all the tools necessary to do jobs like this. Well, we are in the village of Galetta, about 40 minutes west of Ottawa, the capital city of Canada. This is where Ruth's father lives, and this is where we are set up for the next month until we head south again in September. We left Burlington, VT around 10:30am and headed for Plattsburgh, N.Y. It's only 35 miles (56 kms) but there's a ferrry ride across Lake Champlain and the roads are all secondary so the trip took almost two hours. We left the Maple Syrup farm yesterday morning and headed for the town of Montpelier. We had originally thought about finding somewhere to overnight there, but the town is not designed for RV's, and there's very little suitable parking. We got up early yesterday morning, and drove right away to Cabot, Vermont. We figured there might be traffic because of the Cabot Dairy and so we wanted to arrive early. We had never been there and didn't know what to expect. Yesterday morning, we took the little car into Littleton, NH to try and find a better spot for Sherman so we could take the bikes for a ride, but didn't have any luck. Much of the town is built onto the side of a hill and there isn't a lot of suitable spots to park a motorhome in town. We left the Apple Hill Campground yesterday morning, and drove the 6 miles or so into the town of Littleton. Found a free parking lot downtown behind the community center, and close enough to the library to be able to use their wifi internet from the inside of the motorhome. We were up at 5:00am Sunday morning. Made it to the National Forest trailhead parking lot near the Mount Washington cog railway, and began our hike at about 6:30am. Kevin and Ruth staying at a campground? And it’s a private campground? And at $35 a night!! What’s up with that…!!?? Attitash Ski Resort, White Mountains National Forest, N.H. It was another baking hot day. At 10:00am we wandered over to the Mount Washington Science Center. The lady at the front said we could bring Whiskey in, and her immediate boss had said that well behaved dogs on a leash are allowed, especially since it was baking hot outside. Yesterday was a relax day. Surprised that our muscles weren't a bit more sore from our day at the adventure park. We went and did some grocery shopping in the morning, and just hung out at the motorhome in the afternoon. Interesting day yesterday. We left the horse farm before 9:00am and headed into New Hampshire. "Live Free or Die". You gotta love New Hampshire. And, no sales tax and no income tax. Like I said, you gotta love New Hampshire! We relaxed for most of the day, until about 3:00pm when we left Whiskey behind to guard Sherman, and we took the little car into Portland, Maine. We left the winery yesterday morning and drove on the back roads to Freeport, Maine. Freeport's claim to fame is the headquarters of L.L. Bean, and their factory outlet store. We left Acadia National Park around 7:00 am yesterday and drove up the town of Ellsworth where we stopped at the Home Depot parking lot where they have free wi-fi. Then went across the road to Walmart and did some shopping. What a great day we had yesterday. Perfect weather. An excellent morning hike. A nice afternoon bike ride. Cold beer. Each other. Yesterday morning, we drove from Jasper Beach to Acadia National Park and got ourselves set up at the Seawall Campground in Acadia National Park. After lunch, we took the little car for a drive into Bar Harbor. We've never been here before, but we know that the whole area is a popular tourist destination, so we wanted to see what the fuss was all about. Had a totally relaxing day yesterday, didn't really do anything. Went for a walk on the beach in the morning. Ruth made some spaghetti sauce yesterday afternoon for today. When we arrived in Machias yesterday morning, it rained quite a bit. We parked up across from the laundromat, and I spent the morning on the internet while Ruth did some wash. It cleared up though, and we went for a walk around town. We crossed into Maine yesterday around 1:30pm on a beautiful warm summer day. No problems at the border, and in fact the border guards even seemed like they were in a pretty good mood. Had a beautiful day yesterday, with clear blue skies and temperature about 25C (77F). Went for a 7.5 km (4.7 mile) hike in the morning, and then another walk around the third National park campground in the afternoon. Yesterday was another short driving day. In fact, we had our drive for the day finished by 7:30am! As soon as we got up, we drove the 24 kms (15 miles) into the town of Alma. We left Rick and Elaines place just before lunch yesterday and made our way down to Hopewell Rocks. We were at Hopewell Rocks three years ago, but the tide was in at the time, and we wanted to see it with the tide out. Well, we just never know where we're going to end up from one day to the next. We had expected to be just outside of Fundy National Park last night but we received an email yesterday morning that changed our plans for the day. We left early yesterday morning and headed for Halifax airport. Nope, not flying anywhere, I just had to put in the application for my U.S. visa waiver renewal. We're off on another road trip! We're up early this morning and heading for Ontario. I'm not including any more advertising income, because essentially we don't have any! Most of you know that we got shut down by the Google Adsense people. And the new Chitika ads have been a waste of time. First of all, Happy Independence day to all of our American friends! I am wearing my once a year t-shirt for you all today! It is so nice that summer has arrived in the Annapolis Valley. Finally, shorts and t-shirt weather! Well we had a fun Canada Day yesterday! We got up early and drove from the national park to Paula and Jerry's and picked up our little car. Then we took Sherman to Canning and parked up at our couchsurfing friend Tracey's house. For anybody who cares, it's Canada's birthday today. Good enough reason for a nationwide party, I suppose, while the Americans will have their big event on Monday. Personally, I'm not a very patriotic Canadian, so it's not a big deal to me. We have been breaking this rule every day since we made it to Kejimkujik National Park. The mosquitoes are soooo friendly here that we can't help but to feed them! We took a day off from blogging yesterday. Not sure why, just never got to it! Spent the morning getting ready to leave our house sitting at Paula and Jerry's and headed out around noon. Not totally relaxing, in fact in the morning Ruth did some baking, and I gave Sherman's interior a thorough vacuum job. However in the afternoon, we relaxed. Well yesterday turned out to be a productive day. Although we had some showers in the afternoon, we still managed to get a lot done. We've had some poll questions over there on the right hand side for a while now and I thought I'd post the results. On the road early yesterday morning, but only had a short drive to do. First we picked up our little car where we had it parked for the last couple of weeks at Gaspereau Mountain, then we went over to Lindsey's and had a shower and visited with her and Cameron for a bit. Yesterday was an uneventful day. We took our time leaving our free fairgrounds boondocking spot, and then took the main highway towards Halifax, but turned off to take a shorter route towards Kentville. Well, we didn't expect to be in Truro again, but that just goes to show that plans can change! We didn't have a great travel day yesterday, and that's why we're here instead of down along the southeast coast. We drove about 135 kms yesterday, (84 miles) yet we're only about 60 kms (37 miles) as the crow flies, from where we started! As I expected, Adsense is not the only game in town. You'll notice that we now have advertisements again to subsidize the cost of our travels. These advertisements are provided by Chitika and from first impressions, I'm very impressed! More rain, fog, and cold. I forgot to tell you that on Saturday night, Ruth and I and Whiskey slept in the tent and it POURED with rain. We were warm enough, but with the wind flapping the walls of the tent we didn't have a great sleep. And it was drizzly and foggy all day yesterday. A short Canadian history lesson today, and lots of pictures in today's post. It was foggy all day, so it's not that I forgot to clean the camera lens! Yesterday was a busy day. In the morning we hiked the 7.4 km (4.6 mile) Franey Trail, and in the afternoon we drove 158 kms (98 miles) to Louisbourg. This is a 7.4 km hike that takes you above the village of Ingonish and overlooks the Clyburn Valley. It's a pretty steep hike to get up there, and then a gradual decline around the other side. We rate this trail a 7.0 out of 10. We relaxed most of the day yesterday. We have one more hike we want to complete, but it has a few viewpoints and it was foggy and drizzly all day yesterday so we are going to do it this morning. We finally saw a moose! We hiked a 14 km (8.8 mile) trail yesterday and right when we had to turn around at the end of the trail we spotted a moose. We almost missed her, even though she was less than 50 feet away. This a fairly long hike, at 7.0 kms one way. So it's 14.0 kms (8.8 miles) return. It follows an old fire access road that used to go all the way to Lake of Islands, which was 12.5 kms one way, but that section is no longer maintained and we found it mostly overgrown. We give this trail a 6.5 out of 10. We did four separate trails yesterday, for a total of 11.5 kms (7.1 miles). We have now done 57.7 kms (35.8 miles) of our 75 km (46.5 mile) hiking goal! This 2.3 km (1.4 mile) trail goes through the forest up the side of the mountain, with a nice lookoff at the top. Fairly steep in sections, but some stairs are built into the trail. A nice view at the top, we give this trail a 6.5 out of 10. This is a 4.7 km (2.9 mile) loop around Warren Lake. It's a pretty trail, and we really enjoyed this hike. We give this trail a 7.5 out of 10. This 2.3 km (1.4 mile) trail loops through one of the few jack pine forests in the park. There are some interpretive signs along the trail. Again, not a bad trail, but nothing special. A couple of view points make it interesting. However, we give this trail a 5.0 out of 10. This trail goes around a small lake, with another section that goes to the coast and back. We did the other section during the coastal trail earlier on, so this just details the 2.2 km (1.4 mile) hike around the lake. Not a bad walk, but nothing special. we give this trail a 5.5 out of 10. Yesterday morning, we left Bay St. Lawrence and had breakfast at Cabot Landing day use park. After that, we headed just past the village of Neil's Harbour to hike the Coastal Trail. Yesterday we did the Coastal Trail. It's an 11.3 km (7 mile) hike that follows the coast south of Neil's Harbour. It's a decent hike, and we rate it a 7.0 out of 10. There are several hiking trails leading out of the Meat Cove area, and we wanted to do one of them before we left. The girl running the campground suggested the Mountain Trail, and she said we were welcome to leave Sherman where he was while we did the hike. We left Whiskey behind to guard Sherman! We had a great day yesterday. The sun was shining pretty much all day, and although the temperature never got much above 12C (55F), the nice bright sun made up for it. Another short walk, not really a hike at all. And with a full service washroom facility in the middle of the short trail, this one is almost not worth stopping at. We give this trail a 2.5 out of 10. Only a few kms from Pleasant Bay, this is just a short trail of 1.7 kms (1.1 miles) return. It's a nice hike though, and we give it a rating of 6.0 out of 10. Well yesterday started out drizzly and cold and it didn't get any better until the sun went down! In fact, we didn't see the sun all day until 10 minutes before it set. We had a busy day yesterday so we broke it up into three separate posts. We did two different hiking trails yesterday, so I have already done a post about each of the trails. Skyline Trail in Cape Breton Highlands National Park is the most popular trail in the park. But it's not because it's a great hiking trail. I give this trail a 6.0 out of 10, and even then it's only because of the view at the end. Yesterday morning, we did the 8.4 km (5.2 mile) Acadian Trail. This trail also leaves from the Cheticamp Visitor Centre of Cape Breton Highlands national Park. Overall, I give this trail a 7.5 out of 10. Well we already told you about our nice hike yesterday afternoon on the Salmon Pools Trail. It turned out to be a perfect day, however they are calling for 40% chance of rain again for today so we're heading out early to do our first hike while it still looks nice out. Just got back from a three hour hike. Today we did the Salmon Pools Trail which starts out behind the campground at the Cheticamp Visitors Centre of Cape Breton Highlands National Park. Overall, I give this trail a 4.0 out of 10. We did go get some laundry done yesterday in Inverness, and then we sat and waited for the rain to stop. They had been saying 40% chance of rain, but of course they don't have a clue and it rained all morning, eventually stopping around 1:00pm. Maybe they meant it was going to rain for 40% of the day! We don't really have any plans as to how far we drive each day, and yesterday it turned out that we didn't drive very far. We just stop if we see a spot worthwhile to stop at. If not, we keep driving. We said goodbye to our friends in Antigonish, but will probably stop in again on our way back through in a couple of weeks. By the time we left it was after 10:00am. We made a quick stop for some groceries because there won't be any large grocery stores along the Cabot Trail. We hit the road fairly early yesterday, about 9:00am. We took the long route that runs close to Halifax because it's a nicer road and it's actually about the same amount of time as the shorter route. I expected a bit more traffic, but the roads were actually fairly quiet. Well we took off yesterday for our two week tour of Cape Breton Island and the Cabot Trail. We didn't make it very far, but that was by choice. Just a reminder for any last minute entries. Well May was a little cheaper, coming in at just over $1,500 in expenses. And our Adsense had a record month! So overall, it was a decent month. I have ordered new front shocks for Sherman! I'm pretty sure that the front shocks on our motorhome are the original ones from 1995, and now have 66,000 miles on them. Now, that number of miles is still pretty low for a 1995, but when you've driven on Mexican highways you can probably double that! Anyhow, I've ordered Bilstein HD shocks at a cost of $93 each and hopefully they'll show up by Friday so that I can have them installed during our trip out to Cape Breton Island. Well this past weekend I have been out and about visiting. On Saturday, I went out to breakfast with two school friends that I have known since Grade 1. That was so long ago, but we always manage to get together at least once a year. It was nice to get see them and catch up on all the news. I was looking through our pictures over the years, trying to figure out when the last time was that Ruth and I were apart for a full two weeks. Ruth will probably pipe in and answer that question real quick, and I can't recall offhand but I have a feeling it was quite a long time ago. I stopped in town this morning to pick up some clips that I needed in order to put Sherman's dash back together. After that, I was on the way to Lindsey and Justin's because we were going to the 79th Annual Apple Blossom Parade. It's been raining again. I know, I know everyone is tired about everyone's post complaining about the weather. I guess we are lucky, considering we just have to deal with wet weather while others are dealing with floods and tornadoes. We really feel for those people, some have lost everything or are trying to save everything from rising waters. Less than a week to go until Ruth returns and we can hit the road again. When she gets back, we're heading to Cape Breton Island to explore the Cabot Trail. We were there in the summer of 2008 and it's a beautiful part of the world so we're looking forward to going back there for a couple of weeks. One lucky winner will receive a brand new RV cover of your choice! We're going to have a contest! With a valuable RV related item as a prize! Well I think I have gone about 5 days here in Ontario with no rain. I think that is a record! It still hasn't been real nice spring weather, except for Saturday when I went to Plattsburg to pick up Alex, that turned out to be a beautiful day. It is still cool and more overcast than sunny, but I will take that, it helps keep the mosquitoes at bay. Yesterday turned out good enough that it almost felt like barbecue weather. They had been calling for showers again, but it never did rain. Good thing, because Lindsey and Justin and Cameron came up to visit and go for a hike. I spent some time yesterday afternoon working on Sherman. You know, that "to do" list that I am going to get done before Ruth returns! Yesterday was a long day for me. I was going to Plattsburgh, NY to pick up our son, Alex for the very last time. After 5 years of college and university in the States he is finished for good. He has graduated with honours with a Bachelor of Arts degree in Math. Way to go Alex, we are so proud of you. Whiskey (now 15 years old) has a heart murmur that has essentially caused congestive heart failure. She has been prescribed a medication called Vetmedin that makes her heart pump more efficiently. You don't have to be Anonymous. Many of our readers become "followers". Yeah, it does sound a bit like a cult or something, doesn't it? But it's not. It just makes it easy for you to keep up with what we're doing. This is the second post for the day. To read Kevin's earlier post just click on the previous post. We I didn't do very much yesterday. I woke up to rain and it continued off and on throughout the day. So I stayed inside for most of it. I did make my dad his favourite cake and later took KC, my dad's dog for a short walk while there was a break in the weather. Then later on made a nice fish dish for supper. We got another decent day here on Gaspereau Mountain, so I took advantage of it to go for a nice bicycle ride. Only problem is that we are pretty much located at the top of a hill here, it's not really a mountain. So pretty much any direction leads down, which means you have to cycle back up! Well it was an early morning yesterday, up at 4:45am had a tea/coffee and a bowl of cereal and out the door at 5:30am on our way to the airport. Very foggy that morning but no problems as it was dawn so we had some light. Well, not exactly. But that's better than putting a title that says "Defrosting the refrigerator"! Not a bad day however. Not as much sun as I would have liked, but it was nice to have the windows open and just the screen on the side door. Sherman was due for a little fresh air! We did manage to get out for a nice walk in the woods yesterday morning, and I don’t think it rained all day! No sun either, but at least it didn’t rain. A lot of you have Adsense advertising on your blogs. I'm always trying different ways to increase the revenue from Adsense, and our monthly income is starting to show some consistent gains. We’ve going to have to buy an anchor. Because without one, we’re afraid that Sherman is going to float away! Most of our readers know that we're always searching for a deal and that we hate paying full price for anything. So when we bought our first jug of milk after arriving here in Nova Scotia, we had a bit of a shock.